Quick tips to guide you on the key features of VisualDx. At VisualDx, we are mission based: to improve diagnostic accuracy and patient care. Specifically designed to fit into the clinician's workflow, we provide fast, informed decision-making at the point of care. Discover the difference. Now available across general medicine. Build a custom differential based on a chief complaint. Results are just seconds away. See how VisualDx helps you broaden your differential and still make the correct diagnosis quickly using our tab format. Search a diagnosis to access images, Sympticons, and concise clinical information and ICD codes. Search by medication to view adverse conditions that may be caused by a specific drug. Results provide images, evidence, and therapy guidelines. Visualize the symptoms of disease with this trademarked technology. See and experience an enhanced differential, save time, and improve results. With over 32,000 images, we have cataloged the most exhaustive medical image library, showing disease variation to solve the most challenging cases. Accessible anytime, anywhere. VisualDx is always on call. Rated top medical app by Harvard and University of Pennsylvania. Here are your mobile instructions. Continue learning and mitigate risk. Earn points for each clinical query. Learn more on how to satisfy CME requirements while delivering care to your patients. VisualDx offers concise, peer-reviewed content designed for the point of care. Our text is written by medical experts in their field. Medical librarians and medical editors further review the content to ensure it's accurate and up-to-date. Meet our editorial board here. 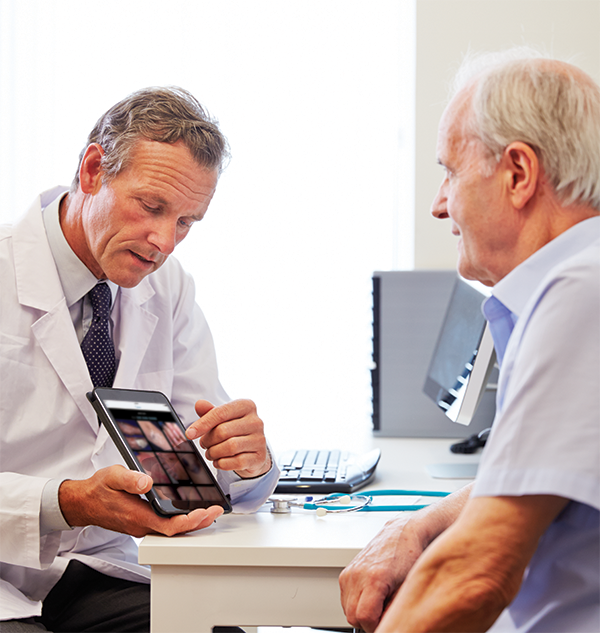 Patient engagement is a key part of the diagnostic process. VisualDx provides handout material for over 200 of its top diagnoses. The information, written specifically for the patient, can be either emailed or printed right at the point of care. VisualDx Clinical Education Series webinars go in-depth on one topic, such as measles, tick-borne diseases, or syphilis. Aimed at healthcare professionals, our presenting experts discuss the diagnosis and treatment of various illnesses. Watch past presentations and sign up to be notified of upcoming webinars.